Do you always set the same table? 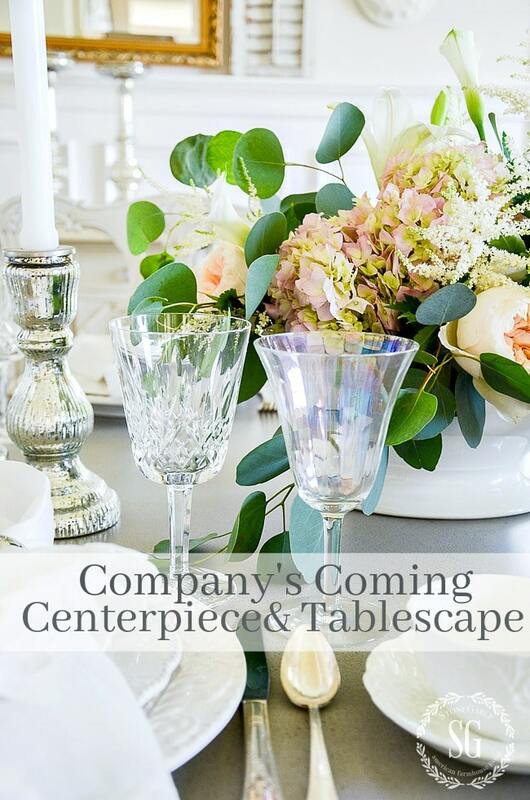 You know… pull out your china, crystal, silver, etc. and set your standard dinner party table. Or maybe you’re the sort who sees a tablescape you love in a shop and you buy all the components and duplicate it verbatim? In both cases you’ll wind up with a lovely table. But will it really be expressing your individuality? Sure, it shows your taste. And not everyone needs to reinvent the wheel every time they entertain. 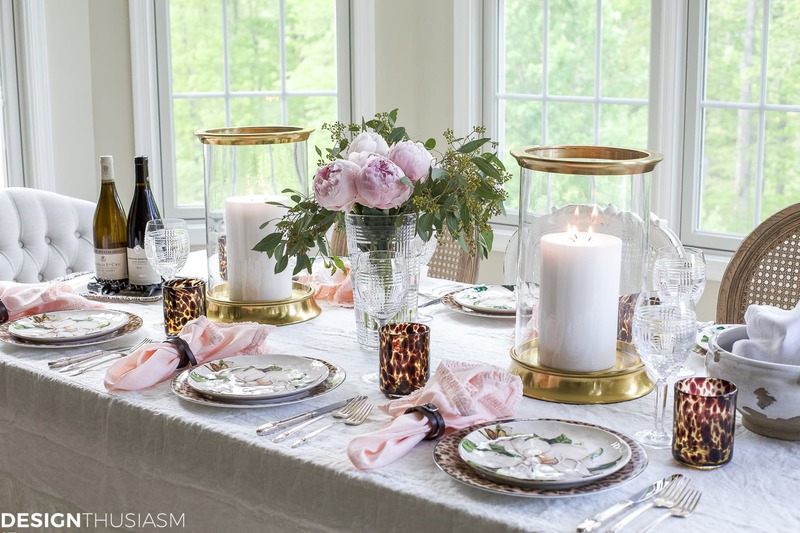 But for me, setting a table, like decorating a home or dressing for an event, is a golden opportunity to make a unique personal statement. For this reason I love to mix and match items that were not meant to go together. Often no two elements are from the same place. In fact, half the time they don’t even match in the classic sense. And the key area I most love to experiment is with layered patterned dishes. Interesting mixes of cool plates are a wonderful way to bring a little bit of edginess to an otherwise elegant table. 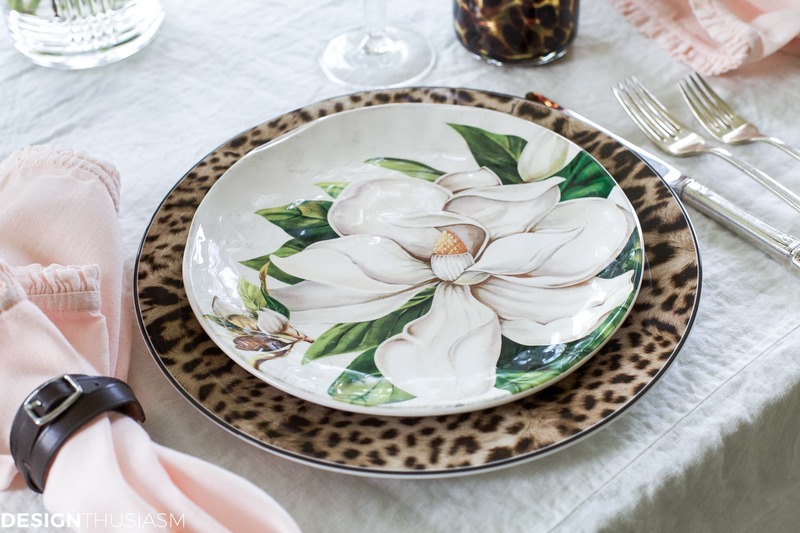 For this table I began with these gorgeous Roberto Cavalli jaguar plates that I received from my sponsor, Amara. They’re a bit pricey, but oh-so-fabulous. With an animal print foundation, you can go in so many different directions and they’ll look different each and every time. On today’s table, I mixed them with a pale magnolia floral for a warm weather feel, but I’m sure they’ll be used on many a table in the future in completely new ways. 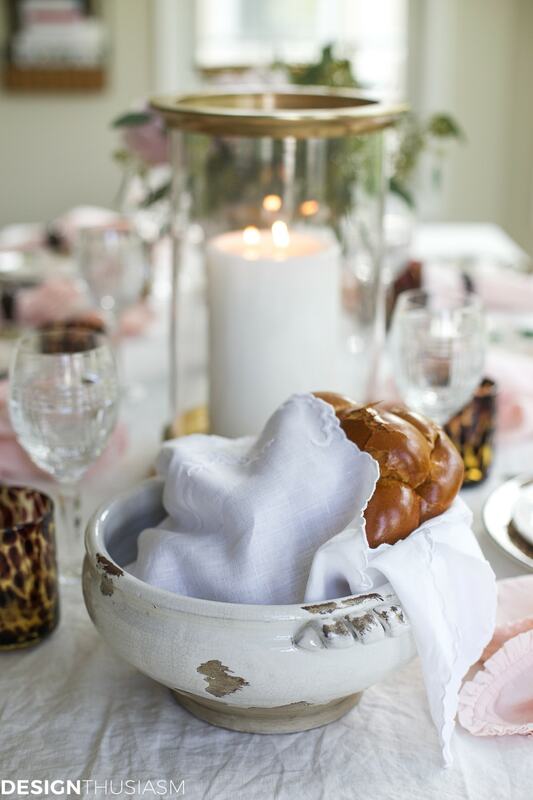 Perhaps part of my signature look is the use of casual distressed pieces on the same table as my most precious items, so a rugged ceramic bowl peacefully coexists with linen, crystal and silver. 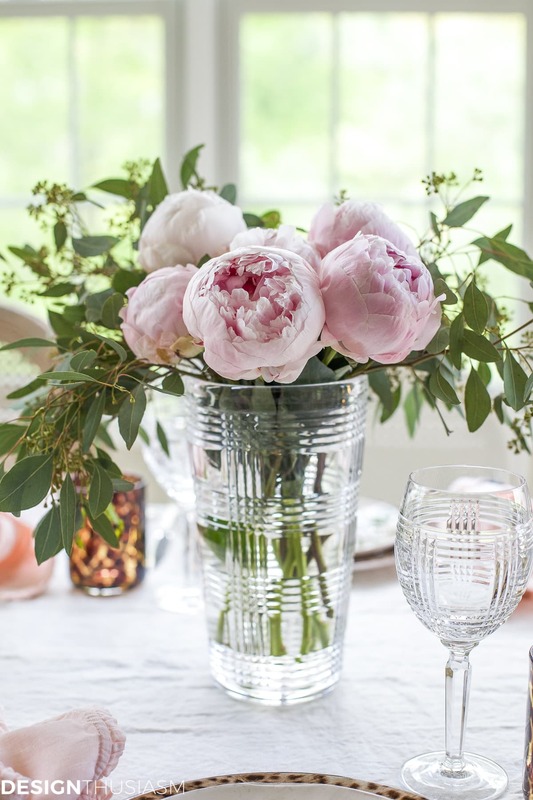 As I hinted this past week, I’ve been on the lookout for peonies since the temperature began to rise, and finally, I found the most lush blooms to add to my table. Lovely in pale pink, with seeded eucalyptus added for drape and movement, the centerpiece is simple but among my favorite kinds. The vase is one I’ve been looking at for quite some time, as it works so well with my crystal goblets. 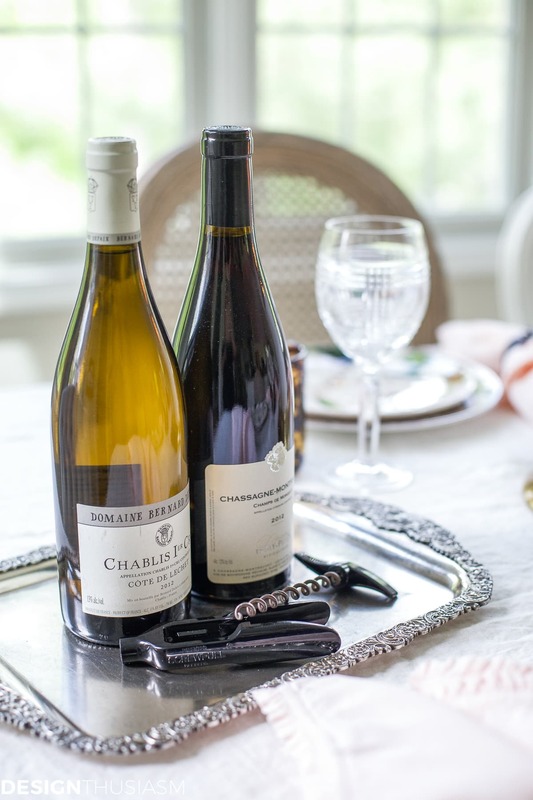 A vintage silver platter serves up some of my preferred French wines. 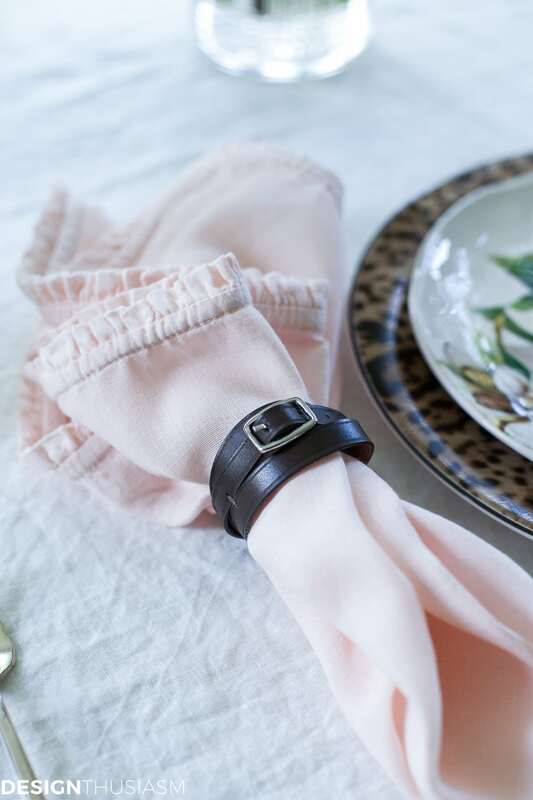 The tiny ruffled napkins are among the items I use over and over, this time belted in a leather napkin ring. It works so well with the subtle safari theme hinted at on this table. The tablecloth is a wonderful washed linen with ruffled edge, very casual in attitude yet crisply white. 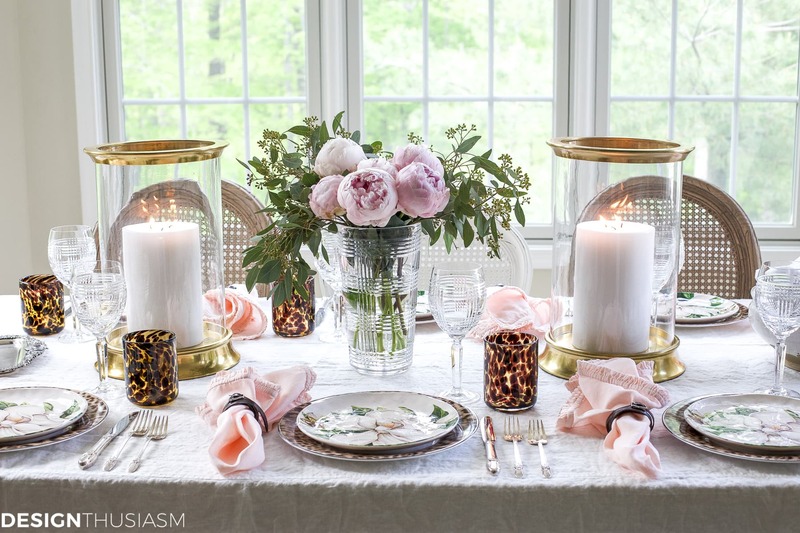 Flanking the centerpiece I used bold brass hurricane lamps, another pair of items I’d been eying for a while. The chunky pillar candles are needed for balance. Today I’m joining with a few of my creative friends who also love to express their individuality. 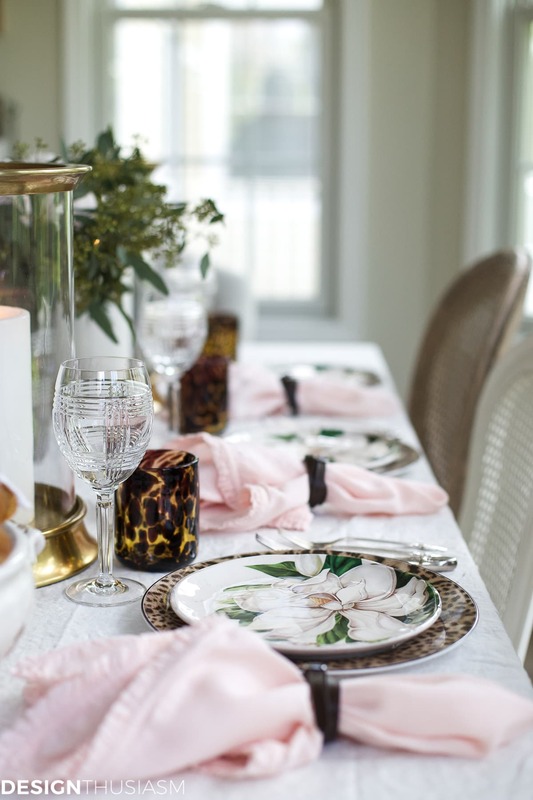 We’re brining you this month’s edition of the It’s All Set tablescape series, so be sure to visit the other tables, linked below. Oh so clever and OH SO BEAUTIFUL!! Beautiful set table. However casual you were being I would have taken the time to present the design on a pressed tablecloth instead of one that looked like you left it in the dryer to long. Love this look and everything about it! 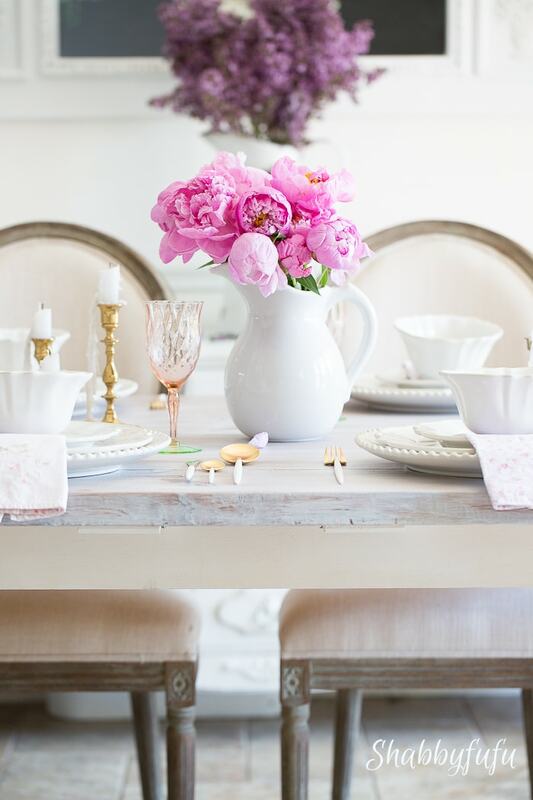 I have a similar white heavy linen ruffled tablecloth. I think the casual beauty of natural linen includes a little wrinkling! Alice, you should probably stick with cotton or a linen/cotton blend that could provide you with more wrinkle control. Gorgeous, gorgeous, gorgeous!!! 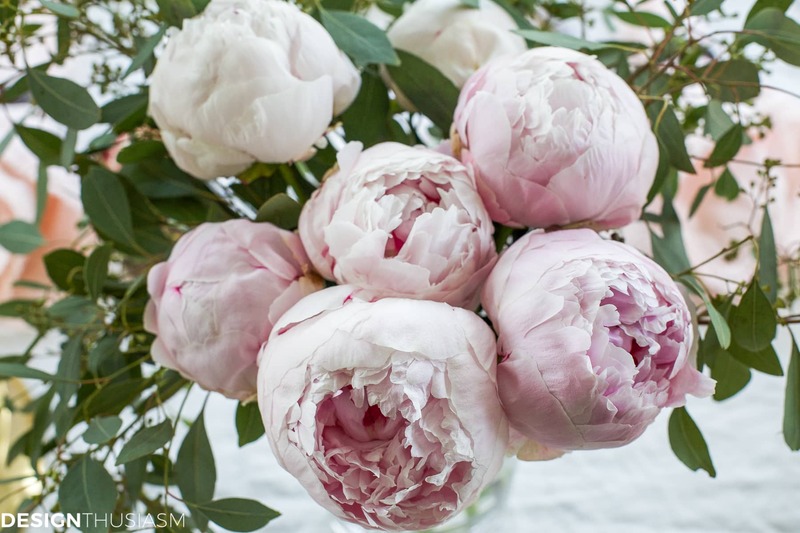 Of course, the peonies take center stage with me. I think you did an amazing job with this. I don’t think if I had a million years I could come up with something this enticing. You definitely have a gift and I thank you for sharing it with us. Love the rumpled look of fresh linen Lory and often do this intentionally myself! Those new plates from Amara are perfect for your style! What a snappy table! 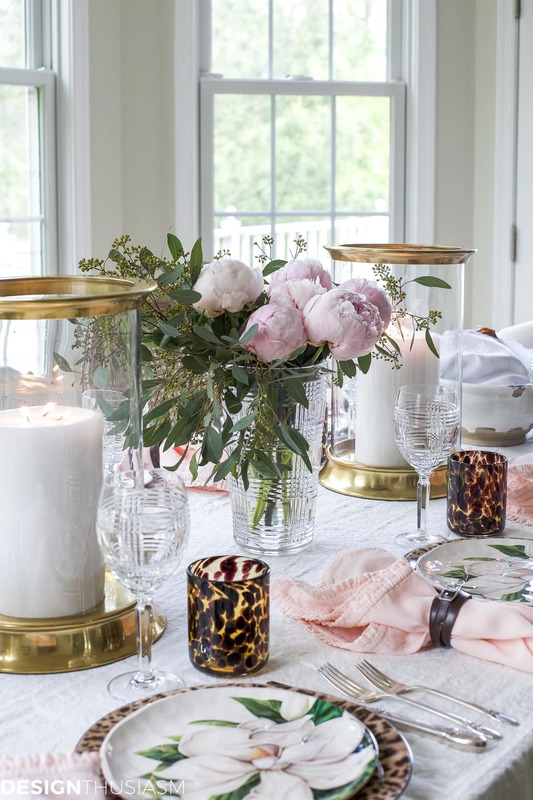 I would have never thought of mixing such traditional china with the fun animal print but I really like it! Especially love the glasses! 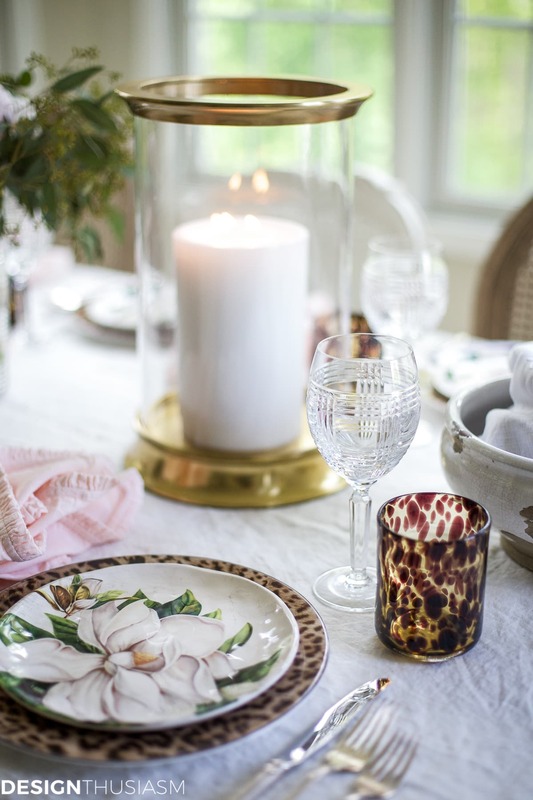 I rarely ‘set’ a ‘fancy’ table so never really had an interest in this sort of thing, but i must tell you, since I found your blog I may have to start! And I think I may just have to start with those glasses! What fun! Thanks for sharing and the inspiration! How did I miss this wonderful table last year??? It’s gorgeous! I’ve seen you use those napkins in other tables, and they always look fabulous! So pretty! And then, here, you paired them with those wonderful leather napkin rings! I just spotted them on sale at WS and ordered them! I haven’t had a chance to use them yet, and I was thinking that I’d use them in the Fall, with Autumn colors. Yet here you are, using them in the Spring with such a soft, pretty palette, and they just work! You’ve got this male/female, romantic/modern, yin/yang thing going on and it put a smile on my face. Love it! You have shown us again and again that a good purchase will stand the test of seasons and time. So nice! And, btw, you are not kidding about how long it takes to put together a lovely table! But so worth it!